Perseverance can be a blessing or a curse, depending on how it is perceived. Records indicate that a Gary Zamarsky purchased a 1981 Fiat Spider 2000. He promptly took his metallic green convertible sport car to his home on Freedman Avenue in Nanuet, N.Y., where it rapidly became the object of interest to all of the neighborhood car afficionodoes including a young Jaime Steve. Steve's father, Larry, was particular interested in the handsome Fiat. For more than ten years Steve says his father pestered his neighbor to sell him the car. After all, the Steve family lived only one block over on Fredric Street so it wouldn't be like it was gone forever. Eventually, Steve's father acquired the car on March 22, 2008 with the odometer showing that the car had been driven only 22,000 miles. Both owners lovingly cared for the metallic green Italian sports car. Unfortunately Steve's father was only able to enjoy the Fiat for just a short three years before he died April 21, 2011 in Mount Vernon, N. Y.
Steve not only inherited the car from his father but also the affection for the car his father somehow passed along. In August of 2011 Steve drove the 2,355-pound Fiat on a joyful trip from Mount Vernon, N.Y. To his home in Alexandria. Va. Riding on 13-inch tires on a 89.75-inch wheelbase the Fiat provided a comfortable ride although interstate highway – or autostrada – motoring is not the car's forte. The car is designed to enjoy roads that twist and turn. Steve reports that on the trip home while seated behind the three spoke steering wheel he had a clear view of the 8000 tachometer with a red line of 6000 rpm and the 80 mph speedometer. The owner's manual claims a top speed of 109 mph. A zero to 60 mph time is also reported ion 10.9 seconds, not bad time for a 1981 car. Steve noted that the plastic sheets covering the interior upholstery that was intended to be removed by the initial owner remains in place, still protecting the tan upholstery. The dashboard as well as the console between the front bucket seats is lined with what appears to be a wood veneer. 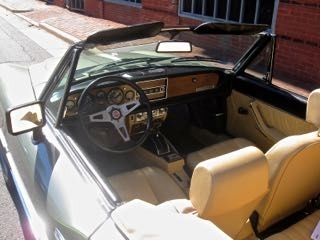 Heater and defroster controls are located on the center console. When new the Fiat Spider 2000 had a sticker price neat $3,000. The sporty car came equipped with such niceties as a mirror in the passenger side sun fisor and an AM/FM radio with two speakers, each one mounted on the kick panel under the dashboard. Steve has driven his 63.5-inch-wide Fiat that stands 49.25-inches high a total of almost 1,000 miles since he took delivery. The car does have a miniscule back seat which is uninviting at best. In a nod to safety the designers of the car incorporated four-wheel servo-disc brakes. Bowing to U.S. Government regulations the graceful chrome bumpers were required to be capped with rubber tips. Steve currently is enjoying the Fiat as much as he father would have before him. The only difference, he says, is that his father always drove the Fiat with the top up and he always takes it out on fair-weather days with the top down.